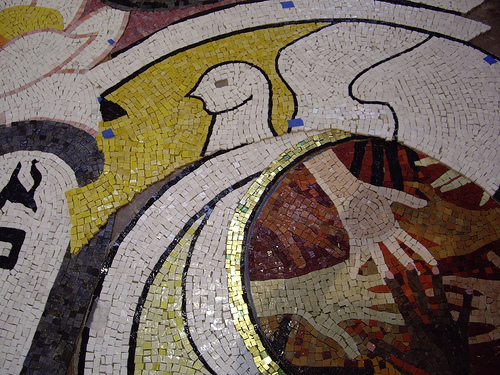 The Peace Mosaic was created as a 50th Anniversary Commemorative Art Piece to honor our congregation’s ministry in the San Ramon Valley. We desired to convey the spirit of Peace and a compelling vision of what our future could become. This was a true Community-Building experience with members from 15 different interfaith communities participating in its creation. Artist Richard Caemmerer created the Design, Jennifer Mitchell, was the Mosaic Artist on site, Rev. Margareta Dahlin Johansson, Co-Chair of the 50th Anniversary Committee coordinated the Mosaic Project. The Smalti/Byzantine tiles were produced by the Perdomo Family in Mexico (who provided tiles for all the works of renowned artist Diego Rivera). 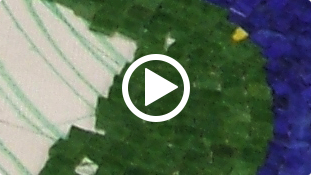 The Mosaic – incorporating 43,000 tile pieces – took 6 months to complete. The stories shared among participants in the process still reverberate. The Installation on the exterior wall of our Sanctuary required an additional four months. 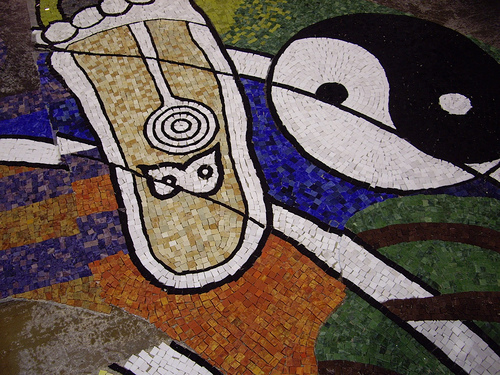 As you walk the Labyrinth with your feet you can now walk the Mosaic with your eyes! The Mosaic was Dedicated on April 6. 2008. Funds were raised from friends of Peace, art lovers and interfaith advocates from literally all around the country. A Dedication Book contains the names of all the loved ones in whose names gifts were given by donors. The primary symbol of this wall, the Dove and olive branch, also comes from this Jewish tradition. Finally, there is along the outside left edge of the mural a ceremonial feather. This refers to the faith of first nation peoples whose symbols are imbedded in natural motifs. One final symbol. The medium of mosaic and the process by which it is executed must be considered a part of its meaning. Thousands and thousands of pieces of colored glass taking hundreds of hours of labor by friends and strangers symbolize in its execution the process of making peace out of pieces. The “format” of the mosaic is a spiral. That is a form of labyrinth which is on the ground in front of it, inviting all to walk with their feet in view of the mosaic where they can walk with their eyes. Both labyrinth and spiral suggest motion, a movement from the ancients to the present, from the now to the next, from birth to forever. And that movement is done in the context of all people of all faiths. The oldest “symbol” is the script above the dove’s head. It is a Sanskrit OM that symbolizes the divine principle of Hinduism. Moving to the right we come to the Clover Leaf, a Christian symbol of the Holy Trinity which leads to the three blue “waves” of the water of Baptism. Continuing in this direction we come to the Crescent Moon and the dome of a mosque, signs of the Moslem faith. A most intriguing design aspect is that each Mandala at the center is interchangeable. 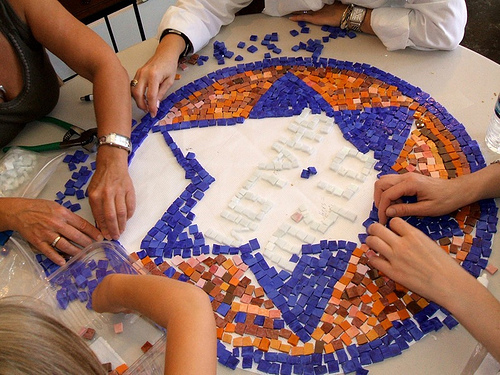 When various interfaith communities are celebrating their Feast Days or Seasons, their Mandala will reside in the center of the Mosaic. Please visit the Peace Mosaic whenver you can. You will find it a stunning visual prayer and meditation. The figure to the left shows the beautiful Buddhist symbol of Buddha’s humanity, his footprint, here simplified. There are quite a few varieties of Buddhism as there are of most religions. The next symbol is the Yin Yang motif common in Taoism and Zen Buddhism. The Tree at the bottom of the mosaic is almost a universal symbol, representing the Tree of Life in the Garden of Eden, or the Bodhi Tree under which Buddha was enlightened. The Lotus is another symbol of Buddhism and you might ask why it is located on the spiral face to face with the dove and not with the other Buddhist symbols. The reason is simple. I liked it there. It seemed to be a quiet sign between the OM and the Tablets of the Law, a symbol of the Jewish faith, as is the Rainbow that refers to the story of the flood and God’s covenant relationship with God’s people. It’s been said that there will be no peace until all faiths learn to get along. This mosaic expresses an attempt to visualize what “faiths getting along” might look like. The mosaic is on the wall of a church. But it is not an inside wall. The mosaic faces the world. Still, some of the church’s architecture is in front of the mosaic. Hopefully it expresses the will of this particular congregation . . . to own the ministry of Peace which is to share that ministry with the world.